Dancehall artiste Konshens and his wife Latoya Wright-Spence made rounds on social media over the weekend. The power couple are currently in Trinidad and Tobago for Carnival 2019 and the “Gyal A Bubble” deejay has been updating fans on Instagram with daily photos and videos of their amazing experience. “OMG this is what i want whenever i get married,” one fan wrote. “Now this is relationship goals he is at Carnival dancing with his wife and his wife only now that is beautiful,” another fan added. Konshens and Latoya celebrated their first wedding anniversary last year. They got married at a private beach ceremony in Miami, Florida in November 2017. The couple, who have a son Liam, had been dating for six years. 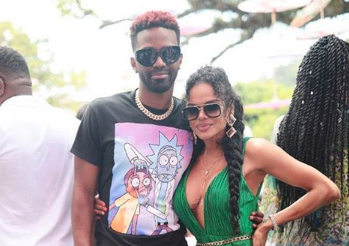 Check out Konshens and wife Latoya at Trinidad Carnival 2019 below.